You'll be £14.99 closer to your next £10.00 credit when you purchase General 'Boy'. What's this? This is the first biography of 'Boy' Browning, whose name is inextricably linked with the creation and employment of Britain's airborne forces in the Second World War. Commissioned into the Grenadier Guards, Browning served on the Western Front, earning a DSO during the Battle of Cambrai. As Adjutant at Sandhurst, he began the tradition of riding a horse up the steps at the end of the commissioning parade. Browning represented England as a hurdler and Great Britain at the 1928 Winter Olympics. In 1932 Browning married Daphne du Maurier, who was ten years younger and became one of the 20th century's most enduring and popular novelists with titles such as Jamaica Inn and Rebecca. Browning commanded two brigades before being appointed to command 1 Airborne Division in 1941, later acting as Eisenhower's advisor on airborne warfare in the Mediterranean. In 1944 he commanded 1st Airborne Corps, which he took to Holland for Operation MARKET GARDEN that September. Allegedly coining the phrase a bridge too far, he has received much of the blame for the operation's failure. In late 1944, Browning became Chief of Staff to Mountbatten. In 1948 he became Comptroller and Treasurer to Princess Elizabeth and Prince Philip and then Treasurer to the latter following the Queens accession. He was a close adviser to the Royal couple who respected his judgement. By this time, Boy and Daphne lived separate lives with Boy working at the Palace in London and Daphne reluctant to leave her beloved Cornwall although the marriage remained intact. Questions exist as to Daphne's sexuality and Boy had a succession of discrete mistresses. After a nervous breakdown probably due to marriage problems, he resigned in 1959 and retired to Cornwall. Browning died in March 1965. I suppose the highest honour any country can bestow on one of their former sailors is to name a warship in their honour. Of course, armies don't have warships but they do name regimental barracks after great men. It says much for the esteem with which Lt. General Sir Frederick Browning is held by the Parachute Regiment that their depot in Aldershot is named Browning Barracks. As is so expertly pointed out inside the book's front cover, there are three elements to Boy Browning's life which might each have been the subject of a separate biography. For those who, like myself, served with Airborne Forces in a former military career, I was particularly intrigued by the way in which he was portrayed during his time as overall commander of Operation Market Garden. At other times during that military career he acted as Mountbatten's Chief of Staff and also advised Eisenhower. Such politically astute generals are normally headed for the very top of their profession but not on this occasion. The second of those three elements is undoubtedly his marriage to the lovely, brilliant and yet exceedingly demanding author Daphne du Maurier. This is a fascinating part of his life and provides those who like biographies but dislike military biographies with an excuse to make an exception in this case. How strange to find the good looking, always immaculate and self-assured general (and paratrooper to boot!) was not so self-confident when found outside the uniform and the work which gave him that air of complete security one would have expected to find at all times. Du Maurier was a sexually complex lady with a will to match any general. Maybe she was the reason for his nervous breakdown! The third and final part of this trilogy is his post-war career in the royal household where he eventually acted as treasurer to the Duke of Edinburgh. Alongside the Duke, it was Browning who was in the car with Her Majesty after her immediate accession to the throne. The Duke of Edinburgh also pays a warm tribute in his foreword. Though "Boy" was just a silly nickname given to him when he first joined the Grenadier Guards, Major General Urquhart said after Arnhem that it was surprisingly accurate. Browning had a harmless vanity, a certain quality of never really having grown up. Recipient of the Croix de Guerre in 1917, the man with the boyish good looks went on to receive two knighthoods a CB and a DSO during a life which really is worth reading all about. I thoroughly recommend this book. This biography covers Lieutenant General Sir Frederick Browning’s military career spanning both World Wars, his marriage to the novelist Daphne du Maurier, as well as his post-war royal involvement in the household of Princess Elizabeth and Prince Philip and then as Treasurer to the latter following the Queen’s accession. I have a confession to make – this is a book that I actually started to write a few years ago, but was ‘warned off’ by a Regimental archive that I approached, who informed me that Richard Mead was already well advanced on writing a biography of General Browning. Therefore I have been eagerly awaiting this book for some time. I’ve written before about the idisyncracies of the military biography. The problem is that the most critical sources – personal letters, diaries, recollections and memories etc – are controlled by the subjects family, who are very unlikely to make them available to a writer who is likely to show their nearest and dearest in anything other than a flattering light. Regiments can be even more protective of their old boys, especially a clan as tightly knit and exclusive as the Grenadier Guards. Therefore the military biography is hardly an objective project at the best of times. But when the subject is a controversial figure such as Browning, this is even more so the case. On balance, Mead’s appraisal of Browning’s role in Market Garden appears apologetic. Most of the serious criticisms of Browning are rebuffed, while a few minor faults are admitted, almost as sacrificial lambs. I remain convinved that Browning was the most pivotal figure in the whole operation, who could have forced changes in the plan but did not, and who should have foreseen errors, but did not. Browning certainly did not protest about taking a grossly inadequate Corps HQ into battle, as he knew it was his last chance to see action in the Second World War. No serious military historian would argue that I Airborne Corps‘ presence in Holland was vitally necessary on the first day of the operation. In the same manner, A Bridge Too Far‘s treatment of Browning is decried, but again, I still feel that the substance of the film is correct – Browning DID preside over a disaster. He did downplay dangerous intelligence, and did have his intelligence officer sent away on sick leave. These are not trivial accusations. Perhaps Dirk Bogarde did play Browning in a less than flattering light, but new evidence would suggest that the screenplay – and the influence of American interests – forced Bogarde into this portrayal, even against his own personal will. In any case, the main complaint is that Bogarde’s protrayal showed Browning to be vain and aloof. But, surely it’s not stretching the imagination to describe someone who designed their own extravagant uniforms as being vain? When the film was released a plethora of military figures protested, but this perhaps had more to do with military loyalty to a superior than anything else. Where Mead really has succeeded is in ‘bookending’ Browning’s life. For too long military history has seen Browning’s life as starting in 1942 and ending in 1944 when he went to South East Asia, with what came before and after as an afterthought. His family background, his service in the First World War, his sporting activities, his regimental service between the wars and his time as Adjutant at Sandhurst all played a part in making Boy Browning the man that he was in September 1944. That he spent virtually all of his career with the Grenadier Guards – very much a closed and conservative environment – perhaps did not aid his work with others who were not part of the Brigade of Guards. He might have been a fighting soldier in 1918, but by 1939 had had a severely limited career that did not prepare him sufficiently for higher command. In much the same manner his subsequent valuable service as Chief of Staff to Mountbatten in South East Asia, Military Secretary at the War Office, and then a key figure in the Royal Households should not be overlooked. In particular it seems that Browning was a very able administrator, particularly for the relatively young and inexperienced Mountbatten. Ironically, this kind of work was perhaps Browning’s strength, rather than active command. Perhaps it is indicative of the patronage system that pervaded the British Army that an officer singularly unsuited to active operations was allowed to reach such a position in the first place. One aspect of Browning’s life that has very rarely been exposed is that of his mental and physical health, in particular in retirement. I have long seen glimpses of this, particularly in my own research, but it’s almost as if a veil of secrecy had been drawn over matters, so as not to portray any weakness on the part of Boy Browning. Not unlike the proverbial elephant in the room. He suffered from a lifelong stomach complaint (perhaps psychosomatic? ), and not infrequent periods of exhaustion and stress. It’s probably unfortunate that somebody with such a stress threshold found themselves in command of the most high-profile failure of the Second World War. After the War Browning developed something of a drinking problem which severely damaged his circulation, suffered from bouts of depression and at one point a serious nervous breakdown. On several occasions he was found with a revolver in his hand threatening to blow his own brains out. Browning’s relationship with his wife, the novelist Daphne du Maurier, is also examined. Both certainly had affairs, and du Maurier had liaisons with a number of women. Browning also seems to have had a difficult relationship with his children. These characterstics certainly co-align with wartime descriptions of him being nervy and highly strung, and cold and aloof. In some respects, it would be interesting to hear the thoughts of a psychologist on this evidence of a very strained life. Although we need to understand what part all of this played – if any – in his wartime actions, we should not think any less of the man purely that he suffered from personal problems. Whilst the controversy is sure to rage on, at least Boy Browning’s life can now be seen in greater context. Whatever Historians might write about him, the focus on Browning’s life and career has for too long been far too narrow. I do not envy any Historian in the task of writing a military biography. Here Richard Mead has made the best effort that perhaps could be expected. The name Lieutenant General Sir Frederick "Boy" Browning is commonly associated with the ill-fated Operation Market Garden. But, a veteran of the Western Front (he earned a DSO during the Battle of Cambrai), Browning is also inextricably linked with the creation of Britain's airborne forces in the Second World War. commander of the parachutes and glider=borne force created at Churchill's behest to match the astounding performance of the German airborne troops in 1940-41. The obstacles were immense and the frustrations took their toll on Browning, always highly-strung and prone to bouts of depression similar to Churchill's 'Black Dog'.. His performance in command of the Anglo-American airborne corps in Operation 'Market Garden' has been open to criticism aver since but the author's close analysis shows clearly why the operation to take the Arnhem bridge failed. Students of that difficult phase of the campaign in north west Europe are well advised to read this account. After the war, following a less than happy tour of duty in Mountbatten's headquarters as Chief of Staff, Browning served as Comptroller of the newly-wed Princess Elizabeth's Household, then as Treasurer to that of her husband the Duke of Edinburgh. He was a resounding success in both posts. His later years, as the Duke writes in a sympathetic foreword, were not happy; both he and Daphne had extramarital affairs although they remained in love with each other to the end. Forty-five years after his death this biography of 'Boy" Browning is timely, at the very least, and many will feel it is long overdue. In Richard Mead it has found an author who has taken great pains to uncover a mass of information from a wide variety of sources, in the process winning the confidence of Boy's family and others still alive who remember him. The result is a fine and absorbing book, well supported by photographs, notes, a list of sources and bibliography, and detailed index, all of which testify to the thoroughness of the work. This careful, closely considered life, lived in testing times by a truly exceptional man, of towering strengths and almost pathetic weakness, is a wonderful human story, beautifully told. it is not to be missed. THIS is a long-overdue book that takes a close look at one of the most controversial British commanders of the Second World War. The popular view of Lt Gen Sir Frederick Browning has been influenced by Dirk Bogarde’s portrayal of him in the classic film, A Bridge Too Far. The author sets out to penetrate the myth and give a balanced insight into the true character of the father of British Airborne Forces and reveals much more of the story beyond his role as the architect of Operation Market Garden and husband of Daphne du Maurier. It is a very personal account of the complex life of one of our most talented leaders. This fascinating biography follows the life of "Boy" Browning through his days at Eton and into the Grenadier Guards, with whom he served as a junior officer in the First World War, and on to his aspiring inter-war career, culminating in his part in laying the foundations of the British Airborne Forces during the Second World War, and, later, serving as Chief of Staff to Mountbatten in South-East Asia. Browning was respected throughout the Army as a highly capable officer who inspired the highest standards in his subordinates, but Richard Mead also exposes the warmer, more personal side of his character that only a select few were allowed to witness. He also chronicles Browning's enduring, but troubled marriage to Daphne du Maurier, and his last tragic years, which, as a consequence of a lifetime of unceasing work, were defined by a series of ailments, both mental and physical. Lieutenant-General Browning has become one of the most maligned figures in the history of the Airborne Forces movement, and so it is most refreshing, not merely to read an account which considers matters from his perspective and attempts to answer the criticisms, but one which acknowledges that Operation Market Garden consumed but a single month in the life of a man whose long career in the military, before and beyond September 1944, was as distinguished as it was highly regarded. This is a long overdue book that takes a close look at one of the most controversial British commanders of the Second World War. The popular view of L Gen Sir Frederick Browning has been influenced by Dirk Bogarde's portrayal of him in the classic film, A Brigade Too Far. The author sets out to penetrate the myth and give a balanced insight in to the true character of the father of British Airborne Forces and reveals much more of the story beyond his role as the architect of Operation Market Garden and husband of Daphne du Maurier. It is a very personal account of the complex life of one of our most talented leaders. This first biography of the man behind the formation of Britain's Airborne Forces and associated with the failure of Operation Market Garden in 1944 is long overdue. 'Boy' gained his reputation as a fighting soldier in WW1, when he won a DSO as a Lieutenant. His belief in drill, discipline, good humour and physical fitness was exhibited in various posts between the wars. He possessed a dual persona: charming and confident in public, but moody, bad-tempered and anxious in his personal life. His marriage to the famous novelist Daphne du Maurier was problematic and may account for this. Mead does not excuse his subject in the forensic examination of Browning's responsibility for the failure at Arnham. Browning later acted as CoS to Mountbatten at SEAC and was appointed Military Secretary after war. He also served in the Royal Household of Princess Elizabeth and the Duke of Edinburgh. Browning's nervous breakdown. his clandestine relationships with other women and his various illnesses are outlined and co-existed alongside his charitable works, artistic interests and enduring love for Daphne. Hopefully this book will encourage other military historians to explore more aspects of his career. General 'Boy' Browning is best known as the commander of Britain's airborne forces for much of the Second World War, and as the senior commander most directly involved in Operation Market Garden, the famous 'bridge too far'. As this biography makes clear he was a rather unusual figure for a senior army officer, and in particular for a Guardsman. His family was involved in the drinks industry, importing Hennessy brandy into the UK, his father sat on the board of the Savoy Hotel, Berkeley and Claridges, and the family had connections in the theatre world, and especially to the D'Oyly Carte family. Perhaps most famously he was married to the novelist Daphne du Maurier. Browning's own professional life began with a largely conventional experience of the First World War trenches. The inter-war period was equally conventional, other than the romance and marriage with the already famous young novelist. Things really changed professionally when he was appointed to head Britain's new airborne forces, where he played a major role in preserving and then expanding the paratrooper and glider-borne units under his command. Inevitably the centrepiece of the biography is Browning's role in Operation Market Garden. This was the first time he had commanded a corps in the field, and he wasn't entirely successful in the role. Mead goes into some detail on Browning's role in the battle, looking at the various mistakes generally attributed to him. One of the more unusual features of this book is that Mead is willing to admit to his subject's failings, while at the same time conducting a generally convincing defence of his role at Arnhem (it has to be said that Browning's own defence of the operation was rather less convincing, and was based on the idea that the operation achieved 80% of its objectives, failing to acknowledge that the final objective, the bridge at Arnhem, was really the only one that mattered). Browning's unusual career means that this book has a rather wider scope than most military biographies, covering his life with du Maurier and his time working for Princes Elizabeth and the Duke of Edinburgh. This should make it of interest to a wider readership than would otherwise be the case, but the military elements are also well researched and presented, so it will satisfy on those grounds as well. On three separate counts, ‘Boy’ Browning is a subject for a biography spanning both World Wars, his marriage to the temperamental Daphne Du Maurier and his involvement in the household of Princess Elizabeth and Prince Philip. This book is long overdue. As a fighting soldier “Boy’ Browning had already acquired a reputation in the British Army by the end of the First World War. As a 20-year-old Grenadier Guards lieutenant he had won the DSO on the Western Front in 1917 for taking command of three companies whose officers had all been wounded and inspiring them to repel attacks by overwhelming numbers of Germans. ... During the Second World War he established himself as a leading advocate of airborne operations and, as Richard Mead’s book makes clear, the creation of Britain’s airborne forces as a distinct fighting arm was very much his achievement. Richard Mead is even-headed and, if we would have liked to know a good deal more about the remarkable marriage to du Maurier, he gives us a convincing impression of what kind of man – and soldier – her husband actually was. 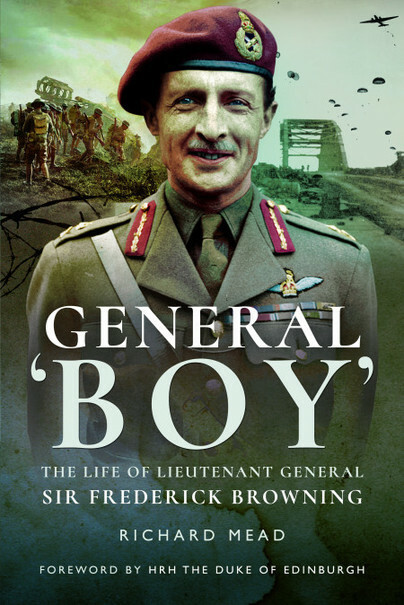 Richard Mead has written an absorbing and personal autobiography of General 'BOY', Sir Frederick Browning. the most controversial British Commander of the Second World War. Probable better known as the Commander of the 1st Airborne Corps and the ill-fated 'Arnhem drop' in September 1944. As a former member, veteran, of the Parachute Regiment, I found this gritty biography of General Browning and the politics and debate, entailed in reaching decisions, which evolved into policy and operations, interesting! Richard Mead, in a well researched book, describes how, as young Grenadier Guards lieutenant, he had his baptism of fire in the trenches, in France during World War One. The nightmare of the mud and slaughter and the rotting bodies in No Mans Land remained with him during his military career. Although lacking independent means, and living on officers pay, he was well connected and popular with fellow officers. In 1932 married a beautiful young author Daphne de Maurier, who shunned living in London as an officers lady, and remained in Cornwall to write such titles as Jamaica Inn and Rebecca. Para-troops and Airborne Division. The author describes Browning's honing of the Airborne Division into a suburb fighting force, the point of a dagger in the armies thrust across the Channel on D Day 1944. A senior officer described Lieutenant General Browning as tall, erect, immaculately dressed, he looked you straight in the eye; he was filled with fire and energy and his magical charm cast its spell over everyone.' The book 'General BOY, The Life of Lieutenant General Sir Frederick Browning is a human story of the man who built and commanded Britain's Airborne Forces. With a forward by HRH The `Duke of Edinburgh', this extremely readable biography covers virtually all human emotions from the relative happiness of 'Boy' Browning's childhood years, through to the excitement and stress of the war years ending in the bitter poignancy of this complex military man's final hours. Deeply researched, it is full of contradictions and surprises. With many personal photographs included, no stone is left unturned as the reader learns (and in many ways) is entranced by the twist and turns of an important military man's life. I urge you to read it. Frederick Browning, or Boy Browning as he was also known, was a man who had to face a trauma that some men never had, fighting in two world wars, he was front line service in the first and then had a higher command in the second. This biography goes into account not only his remarkable military career but also his personal life, and gives insight into a man who on the outside showed confidence and strong will, but on the inside was on the edge personally, because of the strain of his job and the role he played in missions. Browning was controversially the commander of the 1st Airborne Corps during Operation Market Garden, this been a major part of the book that is detailed because of the failure of this operation and the blame rested upon Brownings shoulders. He advised President Eisenhower and became the chief of staff to Dickie Mountbatten, the Duke of Edinburgh's uncle. He had a troubled marriage to the novelist Daphne du Maurier, and suffered a nervous breakdown when he was a Grenadier Guard. Post wars he served in the household of the Royal Family been a treasurer to Prince Philip, this formed an affectionate friendship with the Duke of Edinburgh as seen in the foreword of this book. General Boy is an exciting and deeply researched look into the complex life of Frederick Browning .More commonly known as General 'Boy' Browning, the biography explores the highly regarded General who had a pivotal involvement in both World Wars and includes an exclusive foreword by HRH The Duke of Edinburgh. Not only does the book give a very detailed journey of his extraordinary military career and employment of Britain's airborne forces from 1941-44, but also gives an exciting look into his long and troubled marriage to the famous novelist Daphne Du Maurier and finally covers his involvement in the household of Princess Elizabeth and Prince Philip , and his life as treasurer following the Queens accession. The confidence and valiant nature of Brownings character is evoked in the tales of his military achievements , as are the insecurities and self-doubt of his failures - the book explores the much debated , ill-fated Market Garden operation of September 1944 ,where Browning acted as Commander to the first troop of Air bourne corps . Whilst directly appealing to those interested in Military History , on a personal level it's much more than a traditional Military biography as Mead delves deep into his fascinating yet turbulent relationship with Du Maurier and gives an insight into Browning's private life on a much more personal level than ever before. Whilst Browning was alive he kept his personal affairs very private and this is the first exploration of his complex life, looking at each of his most important roles from father to husband to General and treasurer and how he succeeded in juggling each of his roles . A must read for anyone with an interest in the compelling threads of a General's life and human experience. A military biography with a difference. Controversially Accredited for the entirety of the disastrous Market Garden operation much of Lieutenant General Frederick's contributions to Britain are overlooked though they far outweigh this one ill-fated event. The Market Garden operation is nonetheless covered by Richard Mead and will be the focus of this book for many, but Mead offers many more bridges of Browning's life which stem much further. Browning's personal life is an entrancing war story of a different kind, not only in his complex love affair with his wife but also the battle to keep up a confident front on a tormented and less assured soul. Catalogued over his involvement in both the World War's and much of his achievements after, we see a man of many levels, some of greatness, some of love, some of strife and those of honor, all the qualities that earned him a no less deserved position than serving the Royal household. Mead's book was a wonderful exploration of this mans momentous life and opened the door of insight unto previously unexplored territory. To see how a man of such majesty suffered the anxieties of a mere mortal gave a sense that maybe we are all just human after all. Lieutenant General Sir Frederick 'Boy' Browning is a name synonymous with with the ill-fated MARKET GARDEN operation, when remembered at all. From the onset, Richard Mead's biography sets out to redress this imbalance, exploring the life and character of Browning beyond the events that marked less than a month of his lifetime of military service. As outlined by Mead, however, this proves no easy task; Browning having actively discouraged any such work throughout his lifetime. This perhaps goes some way to explain the rather two-dimensional portrayal, if not vilification of Browning in the works of other military historians. Mead explores the remarkable military career of Browning, encompassing a number of high profile positions across two world wars and an instrumental role in the formation of Britain's Airborne Forces, concluding with his post-war royal appointments. Mead's biography, however, further seeks to outline the character of the man behind the service record. A consummate professional soldier, Browning was uncompromising in demanding a high standard of service from those who served beneath him, as well as himself, and with a gift for inspiring great loyalty and affection in those who served with him. Through exploration of the relationships between Browning and those closest to him, particularly his tempestuous marriage with novelist Daphne du Maurier, Mead also portrays a different 'Boy' marked by an uncertainty in stark contrast to his more public and professional exterior. Mead's biography provides a fascinating insight into a man too often dismissed by military historians for his role in a single disastrous operation. He lives near Cirencester, Gloucestershire. Richard Mead's book 'The Men Behind Monty' was one of six military titles shortlisted for the British Army Military Book of the Year 2016.